This past week, civilians from the islands of the Caribbean to South Carolina had to deal with the wrath of Hurricane Irma, the most intense hurricane observed in the Atlantic Ocean since Dean back in 2007. In neighborhoods all over the Sunshine State, there were many reports of power and Wi-Fi loss, flooding, tornado warnings, and fallen trees. Our own beloved Rollins campus experienced carnage of its own in Irma’s wake. The normally picturesque campus was found covered in debris after the storm, and while thankfully the power did not give out on campus, there was still a lot of cleanup to do before the campus could run normally. “When Hurricane Irma hit, I stayed in Bush [Science Center] because my family lives in Maryland and I couldn’t go back to escape. When we left Bush, I saw so much debris around that it was unbelievable.” recalled Caitlin Cherniak ’18. Caitlin and many other students, faculty, staff, and members of the Winter Park community with a similar passion for our storied campus gave back in a big way in just a little over three hours on Wednesday September 29, by volunteering for the “Anchors Down, Clean UP!” event. The event began on Critchfield Park as assembled volunteers were given waivers, gloves, sunscreen, and other supplies to make their jobs run smoothly. 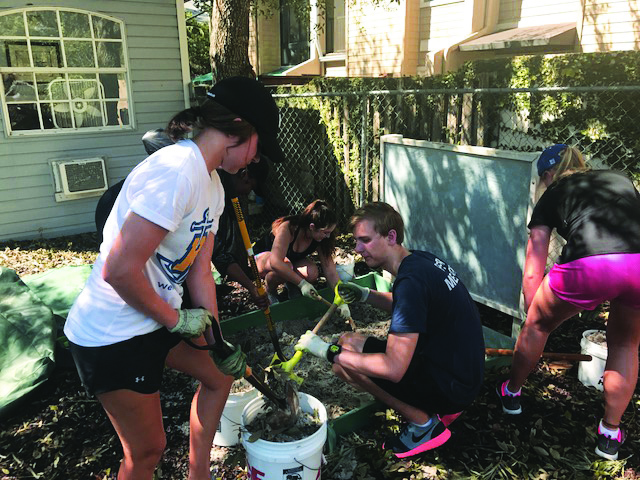 Volunteers were assigned their jobs after a welcome speech from President Cornwell, most responsibilities consisted of picking up fallen debris around various zones on the Rollins campus. The debris was placed in approved piles along the grass so that the landscaping department would have an easier time getting rid of branches and moss strewn about in clumps after Irma. After the debris was sorted through and cleaned up, the volunteers had the option to write thank you notes to those who had given their support to those on campus during Irma. Finally, the event capped off with a few closing remarks made by several volunteers about their feelings about the events of the day and the past week as a whole, concluding a free celebratory lunch in the campus center to thank all of the volunteers for their hard work. Hurricane Irma may have been strong, but the Tar spirit is stronger.